Emma was the cutest most adorable muffin. Mom was so nice and sweet for her babies newborn session, she was just a delight to work with. As soon as we started I knew right away this was going to be a great newborn session. This perfect little girl slept for almost the entire session. If you are looking for an Amherst newborn photographer we offer in home newborn sessions as well as session in our studio. We did some parent shots, and they just came out stunning. 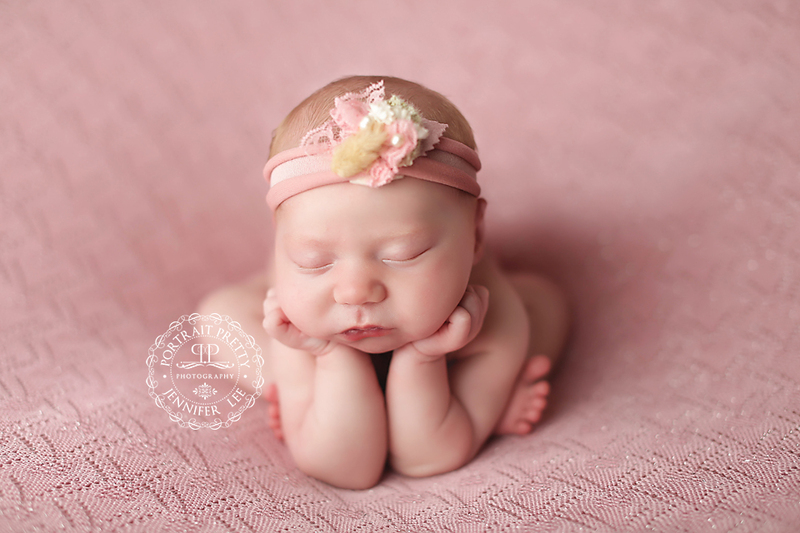 I used an outfit from 2 Willow Lane, and a gorgeous knitted headband from Bonnets and Britches. Their bonnets make any baby dazzle with that simple and soft touch. She makes the absolute best props for babies that are just gorgeous and pretty. Here are some of my favorite images from her session. Amherst Newborn Photographer Jennifer Lee of Portrait Pretty Photography is one of the most sought after newborn photographers in WNY, her focus is in newborn posing and safety. Jennifer services in your home sessions for all of WNY and has a studio in the Southtowns.